Open or close your winter concert in style with this tuneful medley of two popular Christmas carols, "Hark! The Herald Angels Sing" and "O Come All Ye Faithful." 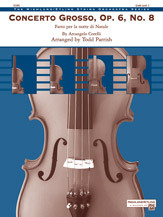 The arrangement is scored for full orchestra; however, it is also completely playable by string orchestra or strings with any number of winds. This is an excellent piece to introduce your students to a full orchestra experience! An alto sax part is included, so this piece may also be played by combined band and orchestra. Dieses Produkt haben wir am Sonntag, 14. April 2013 in unseren Katalog aufgenommen.